Although the Diamondbacks snapped a six-game losing streak on Tuesday night via a 2-1 come-from-behind victory over the Brewers at Chase Field, an 8-2 drubbing on Wednesday means they’ve now lost seven of eight and 10 of 13 to fall to 25-18. Particularly with the loss of A.J. Pollock to a fractured left thumb, the NL West leaders have begun to look quite vulnerable. Their offense has ground to a halt, eking out just 2.53 runs per game this month, they’ve got an increasing number of rotation concerns, and according to our Playoff Odds report, they’ve lost more ground over the past week than any other team. The big news is the loss of Pollock, who rolled his glove hand awkwardly after coming up empty in a dive for a drive off the bat of Tyler Saladino on Monday night. Pollock suffered an avulsion fracture, meaning one that occurred where a tendon or ligament attaches to bone. Fortunately, he doesn’t need surgery. Adding insult to injury, however, Saladino was able to round the bases for an inside-the-park home run in what turned out to be a 7-2 defeat. The shame of it is that Pollock — who, after a breakout 2015, missed most of 2016 with a fractured right elbow and a good chunk of 2017 with a groin strain — appeared to be on his way to an impressive season, hitting .293/.349/.620 with 11 homers, a 156 wRC+, and 2.3 WAR. As Craig Edwards noted just last week, the 30-year-old center fielder had benefited from a more aggressive approach and some tweaks to his swing, sacrificing some amount of contact for power. Both his slugging percentage and WAR lead the National League, while his home-run total ranks third, and his wRC+ sixth. As Arizona Central’s Nick Piecoro pointed out, Pollock is the third Diamondback to miss significant time this season due to an injury sustained while diving for a ball, after right fielder Steven Souza Jr. and third baseman Jake Lamb. Souza suffered a right pectoral strain in late March — a spring-training game — and didn’t make his season debut until May 3. Lamb sprained the AC joint in his left shoulder while going for a foul ball on April 2 and then battled a bout of inflammation while rehabbing. He’s finally on track to return this weekend. For as much as manager Torey Lovullo may have praised each of the injured players’ maximum effort, the losses of Souza (who posted a 120 wRC+ for Tampa Bay last year) and Lamb (111 for Arizona) have contributed to the Diamondbacks’ offensive struggles, and that of Pollock figures to as well. The team’s .220 batting average ranks dead last in the majors, their .300 on-base percentage just two points out of last, their .380 slugging percentage is 28th, and their 84 wRC+ 27th. Amid this month’s offensive drought, they’ve slipped to 13th in the league in scoring at 3.95 runs per game. Thanks to the improbably solid work of Daniel Descalso, the owner of a career 83 wRC+, the team’s third basemen have combined for a solid .242/.333/.425 (106 wRC+) line, but between Jarrod Dyson, Chris Owings, and Souza, who’s 6-for-39 since returning, the team’s right fielders have “hit” a combined .166/.236/.276 for a 37 wRC+. All three need to find their strokes, as Dyson and Owings figure to cover for Pollock’s absence. Whatever gains Owings (.202/.266/.316, 56 wRC+) and shortstop Nick Ahmed (.213/.275/.412, 82 wRC+) made early in the season via what Piecoro described as a team-wide philosophical shift to a hitting approach based upon pitch tunnels appear to have vanished. 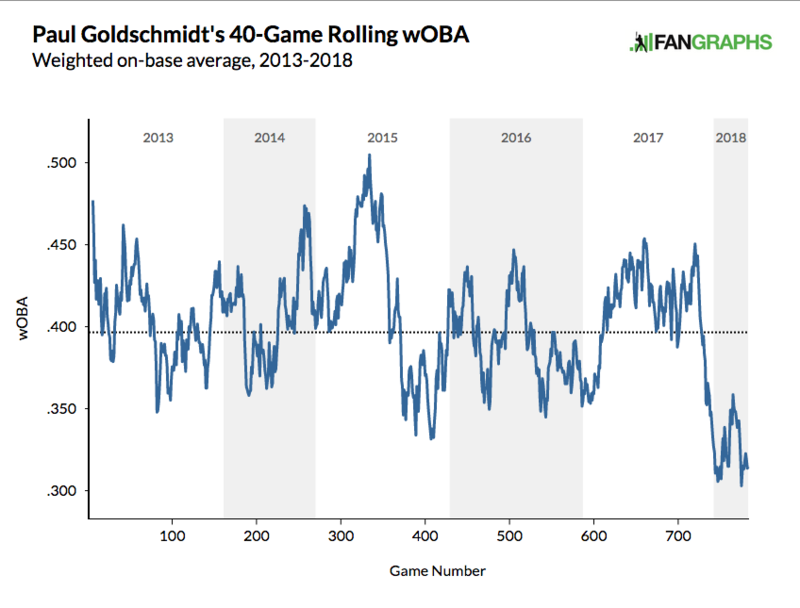 Goldschmidt’s actual wOBA has historically tracked pretty well with his expected wOBA based upon launch angles and exit velocities — except for this year. He’s elevating the ball a bit more often than usual, and he’s in the upper third of the league when it comes to the number of balls he’s hit with an exit velocity of 95 mph or higher, but getting none of the payoff. It’s fair to wonder if that’s a product of the new humidifier at Chase Field, particularly with Goldschmidt hitting an unsightly .140/.321/.209 (with no homers) at home, but his average exit velocity at Chase is 89.7 mph, and his xwOBA there still a relatively respectable .353, compared to the actual mark of .260. Last year, both his expected and actual marks at Chase were .442. *That is, line drives and fly balls, combined. Statistics through Tuesday, May 15. Through the first 25 home games of the year, home runs and scoring levels are down by about one-third, and while the average exit velocity hasn’t fallen by that much, the xwOBA has, and yet players are still underproducing relative to the lower expectations. Of course, the same forces hurting D-backs hitters are helping the club’s pitchers, and thus far, the Arizona moundsmen have yielded an NL-low 3.62 runs per game. Within the rotation, aside from Zack Greinke, who’s been better than average in terms of both ERA and FIP (3.46 and 3.19, respectively) and Zack Godley, who’s been a bit worse than average (4.08 ERA, 4.21 FIP), concerns abound. Patrick Corbin has the unit’s best ERA and FIP (2.53 and 2.73, respectively), but the alarming velocity dip that Jeff Sullivan observed last week persisted in his last start. After averaging 92.8 mph with his four-seamer through the end of April, he’s at 90.4 mph through three starts this month, and the four runs he allowed in six innings on Monday were his season high. Taijuan Walker underwent Tommy John surgery on April 25, and Robbie Ray went down four days later with an oblique strain. He’s yet to throw off a mound again, which means he won’t be back until the end of the month at best. Matt Koch, the 27-year-old righty who took Walker’s spot, has a 4.06 ERA, 6.14 FIP, and 13.0% strikeout rate through his first six starts. Clay Buchholz, whom the Diamondbacks signed and stashed at Triple-A Reno as of May 4, could eventually get a look, and Shelby Miller, who’s working his way back from May 2017 surgery, could return later this summer. Fortunately, the Diamondbacks’ bullpen has been stellar, with the league’s lowest ERA (2.42), second-lowest home-run rate (0.6 per nine), and fourth-lowest FIP (3.35). Brad Boxberger may not have Fernando Rodney’s prowess at invisible archery, but he’s converted 12 out of 13 save chances and whiffed 31.6% of batters faced. Archie Bradley has shown that last year’s dominance as a setup man was no fluke, and 34-year-old Japanese import Yoshihisa Hirano has quickly become one of Lovullo’s most trusted arms. The Diamondback’ early NL West lead owes something to a lopsided schedule, as they’ve played more home games than any other team besides the Padres and beaten the snot out of a particularly disheveled Dodgers squad. They were 7-1 against the Dodgers as of May 1, and they’re now 8-4. Fifteen of their next 21 games are on the road, and while the Brewers are the only opponent from that group that’s more than a game above .500 at this writing (they host the Reds and Marlins, and travel to the Mets, A’s, and Giants), it’s not as though they can just put it on autopilot. As of May 10, their Playoff Odds stood at 61.4%, but they’ve fallen 16.8 points to 44.6%, the largest drop in the majors in that span. They’ll have to weather the storm without Pollock, and hope that players like Lamb, Souza, and the real Paul Goldschmidt can pick up the slack and inject life into their flagging offense. We hoped you liked reading Losing Pollock Isn’t the D-backs’ Only Problem by Jay Jaffe! DBacks fan here and I’ve been worried about them since the off-season. They’ really needed Goldy to be Goldy, their better hitters to keep up production (Lamb, Souza, Pollock, Peralta) and the starting pitching to stay healthy. Thus far, almost none of that has happened and the good record is due in large part to inspired play from unlikely sources (Descalso and Ahmed at the plate, Koch on the mound) that isn’t likely to last. – Couldn’t the offensive deficit at Chase simply be worse hitters this year? – Chase is domed, summer weather should have little effect on hitting there. – You also cannot overlook their defense which is currently 3rd in UZR/150 and 1st in total UZR. They routinely run out 3 and at times even 4 natural SS (Ahmed, Marte, Owings, Marrero) which combined with the usual good D from Dyson, Pollock and Goldy means they turn a lot of borderline plays into outs. One thing they do have working for them is the demise of the Dodgers – not a lot has gone right for them this year. As much as the D’Backs have been scuffling and suffered a few big injuries, I don’t know who else will win that division. Rockies maybe? Dodgers can still get hot and go on a big tear and get back into this thing too. I still wouldn’t count them out, no matter how bad they look right now. They’ve got too much talent to play this bad all year.